Nina Rosenblum's new film reveals the human rights violations taking place in a bizarre prison experiment. Nina Rosenblum's Female High Security Unit looks like it will be one of 1989's most important examples of the investigative documentary form. The director of America and Lewis Hine, a much-heralded documentary of 1983, Rosenblum is currently completing a feature-length expose of how selected women prisoners in the United States have been held in permanent underground isolation under conditions of extreme sensory deprivation. The severity of their conditions has been denounced by organizations including Amnesty International, The American Civil Liberties Union, The Center for Constitutional Rights and the United Methodist Church. Her work in this area has already had some effect: the Lexington, Ken­ tucky unit where these women were held was shut down after a portion of Female High Security Unit aired on NBC's 'Today Show' in July, 1988. Two prisoners brought a court case against the Bureau of Prisons, charging it with violation of the First Amendment—and won. As The New York Times reported on July 17, 1988, Judge Barrington Parker found that "the designation of prisoners solely for their subversive statements and thoughts is the type of overreaction that the Supreme Court has repeatedly warned against." Initial funding for Female High Security Unit—which will be a PBS/WNET Special following a theatrical release— came from the Woody Guthrie Foundation. 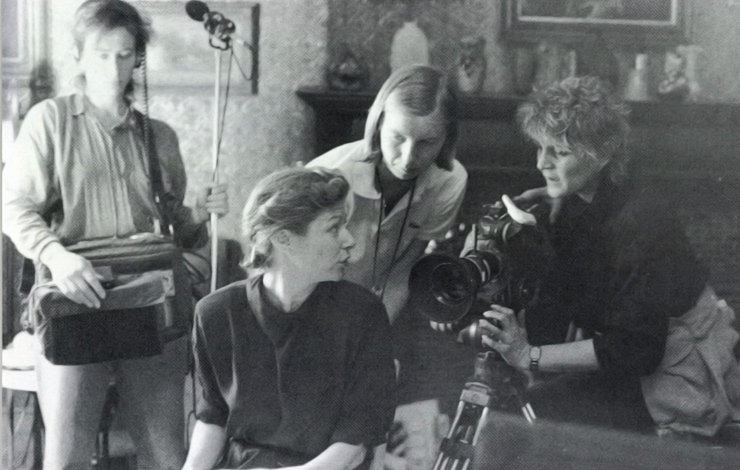 "The source of major funding was the Kentucky Foundation for Women, who came to the aid of this film when it was just an idea," Rosenblum said in her Manhattan apartment. "The development of the film was due to Sally Bingham, who was perceptive enough to understand there was a real story here." Rosenblum also received the CFI Labs/Los Angeles Women in Film Foundation Completion Award. Additional funding came from Channel Four in Britain, where the film will have an international television premiere. Among the respected film artists who became collaborators are cinematographer Haskell Wexler's (Medium Cool, Matewan), who donated his time as well as stock and crew; Hart Perry and Barbara Kopple (Harlan County, USA) who worked as cinematographer and sound recordist, respectively; Danny Schechter (producer, ABC "20/20"); and sound editor Maurice Schell (Apocalypse Now, All That Jazz) who became a contributing producer. 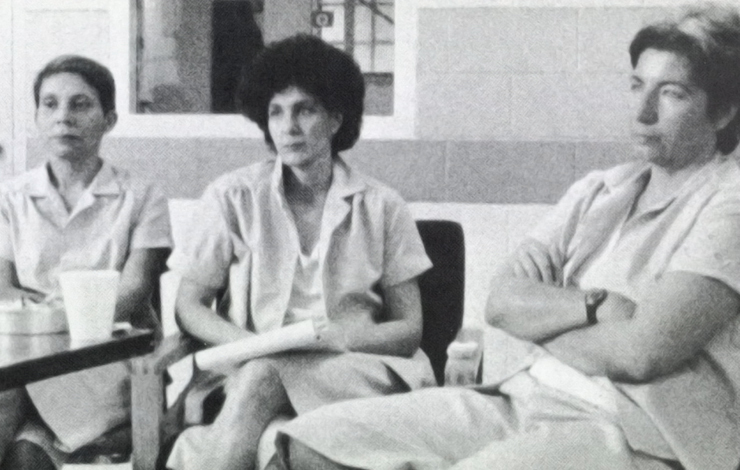 Interviews with politicians, writers, medical experts, prison and government officials are interspersed throughout Female High Security Unit, but the film's focus is on three self-proclaimed political prisoners, Silvia Baraldini, Susan Rosenberg, and Alejandrina Torres. Silvia Baraldini, an Italian citizen who came to the United States at the age of 14, was active in the anti-war movement in the sixties, and was then convicted of conspiracy and racketeering in connection with the Brinks robbery. Baraldini is currently serving a 43-year sentence under RICO, the anti-racketeering law. She has developed cancer since confinement and suffers from hallucinations, severe claustrophobic attacks, and physical deterioration. Susan Rosenberg, convicted in 1985 for possession of weapons and explosives, received an unprecedented 58-year sentence—as compared to an average 3-5 year sentence for a first offense—with a recom­ mendation that she be denied parole. A graduate from Barnard College who worked as an acupuncturist in the Lincoln Hospital Clinic, Rosenberg was active in the civil rights and antiwar movements, and still maintains her political convictions after eighteen months in isolation in the High Security Unit. Alejandrina Torres was sentenc­ ed to 35 years for seditious conspiracy 'conspiring to use force to oppose the lawful authority of the U.S. over Puerto Rico.' Her physical and mental health have been severely affected by conditions in the Unit. When asked how she became involved in their plight, Rosenblum replied that it was because Susan Rosenberg's attorney asked her "to cut a tape of Susan shot three months after she had been in the Unit," the filmmaker recalled. 'She was in Manhattan at the Metropolitan Correctional Center, as a witness in another trial. 'A Network News producer went in and shot an interview with her, and they asked me to cut a tape to be used in her sentence­ reduction hearing. Susan Rosenberg had been locked underground under conditions of sensory deprivation, 24-hour video surveillance, sexual abuse, allowed no contact with the outside world except for two 15-minute telephone calls a week. She was permitted outdoor activity in a wooden pen for one hour a day—a pen that looked like a prisoner-of-war camp—and strip-searched when she returned to her cell." The fact that these prisoners are female makes the story different from that of "political" male prisoners. Rosenblum elaborated that 'in the maximum security prison for men, there is tremendous physical brutality and violence: men are chained to their beds, and beaten. "With women, you don't see anyone beaten, but the mental deterioration is reflected. They're not bleeding, but... these women were sexually brutalized; they were dragged into a hospital room and body cavity-searched, screaming so loud that one of the other prisoners—a non-political woman who happened to be there at the time-talks about it with horror. There was also a camera facing the showers, which had no curtain, and the male guards could watch them. "But I recently shot an interview with Susan Rosenberg in a Washing­ ton, D.C. jail. Even though things sound good on paper, what happened is the opposite: she is indicted in another case in Washington. So she is kept in 23-hour isolation, handcuffed and chained whenever she's out of her cell. "By the time I saw her, the effects of 22 months of isolation were evident. She said to me on film that she would like to visit a torture clinic. These exist in Canada for international torture victims. Her sentence for possession of weapons was six­ teen times higher than the national average in 1985 for murder." "Silvia Baraldini developed severe cancer, was operated on in a prison hospital, and was recuperating in the Metropolitan Correctional Center, a pre-trial detention center with no programs of any kind. Alejandrina Torres—who developed a heart condition—was placed in general population and, from what I understand, is doing better." ''What happened after the court case," she continued, "was that they sent the non-political women who had been put into the unit (to cover up the fact that it was a political prison) down to Marianna, the new maximum security federal facility. This is supposed to be the unit that will house offenders from around the country who are maximum security classified. "What this means is that all of these women will be funneled back down to Marianna, a small women's control unit within a men's prison, in a seventh-generation southern prison town. Federal Judge Barrington Parker warned the Bureau of Prisons against transferring the mission of Lexington to Marianna." At a national human rights conference in New York, Rosenblum learned that "the prison population in the past ten years has doubled,'' in her words. "And it's projected to double in the next ten years. It's becoming an industry, which is dependent on increasing the number of prisoners. 'Tm not making a direct analogy, so don't misunderstand me,'' she said tentatively. "But I tried to find a psychiatrist who would be willing to go into the unit and interview the prisoners. I met with Roland Parker, and the first thing he did was hand me a document which came from a German newspaper—Goering's statement about how Dachau began as a small­ group isolation center to take political people out of the general population. "While there is no direct parallel, it becomes very frightening to think we have subterranean prison cells here where individuals, because of their beliefs, are being placed and tortured. People know very little about this, and the media doesn't really want to break these kinds of stories. It 's very difficult to challenge the Bureau of Prisons." Rosenblum's work seems con­tinuous with the aims of human rights organizations such as Amnesty International, especially when she acknowledges that her main intention in making Female High Security Unit was to "raise international consciousness—that indeed, in America, there are profound human rights violations taking place in a bizarre prison experiment. ''I also want the film to bring attention to the reasons these political people went to prison: they didn't have to go. They were middle-class, educated, living comfortably — but they felt so strongly about what was happening to poor people in this country that they put themselves on the line. And I really feel that there is now a tremendous campaign to grind poor people into nothingness. Our society is moving so far from any real caring for the under-class." The issues in Female High Security Unit are not limited to the United States. In the director's assessment, "they have international ramifications, in that this country says we have no political prisoners or human rights violations. The reality is quite different, and opens up the whole issue of who is in prison: how many poor people? How many minorities? Why is the number of women in prison expanding? ''The film will also look at the use of mind control and brainwashing experiments that were learned from what was done with American POWs in Korea. Authorities have studied and documented the use of these techniques in prisons: there is definitely a concerted effort to break these people who are in these units. "The existence of a prison where mind control is used to 'break ' prisoners is in direct contradiction to the First Amendment of the Constitution, which protects citizen's freedom of speech and association," she con­cluded. ''Americans are vigilant in monitoring human rights abuses throughout the world. Female High Security Unit exposes human rights abuses within our own prisons." Annette Insdorf is professor and director of undergraduate film studies at Columbia University.